Is your quilt too big to easily manage? If your quilt becomes too large to handle easily when adding borders, set up a card table beside your sewing machine to support the extra weight of the quilt. Act like a frame on a picture, giving visual boundaries to the central design and “containing” it. Enhance and emphasize the central design. Coordinate with and bring out a particular color from the center. Enlarge a quilt without making more unit blocks. Width of the border(s) should enhance but not be so large as to visually outweigh the central quilt design. The scale, or size of the pieces and motif, or shape of border pieces, should echo or be similar to those in the rest of the quilt when using a pieced border. The color of the outside border will tend to bring out that color from the center of the quilt, especially when there are approximately equal amounts of several colors in the interior of the quilt. Plain borders are simply ones that are not pieced. They may, look quite fancy if a border print is used but the corners must be mitered to make the design turn the corner gracefully. Mitered corners are still fairly simple to construct. The time you spend learning to add borders with accuracy will pay off in a more beautiful quilt. Borders should be cut in length to fit the center of the quilt. Cut border strips longer than you think you will need and later trim them to the exact measurement needed after the center of the quilt has been pieced and measured. The quilt needs to end up “square” with 90° corners. Top and Bottom dimensions should be equal. The two Side dimensions should be equal. It is not unusual to need to ease one side of a quilt to fit the border and stretch the opposite side slightly to fit the same dimension. Again, to keep the quilt square, both side borders must be cut the same length and the top and bottom borders must the same dimension as each other. These four points are the KEYS to FLAT BORDERS. Cut borders from the lengthwise grain if at all possible. Cutting from the length of the fabric means you do not have to piece the border. The lengthwise grain is more stable so the border will have less stretch than borders cut on crosswise grain. If you have multiple borders and it is too expensive to buy enough fabric to cut them all on the lengthwise grain, try to at least cut the outer border of the quilt on the lengthwise grain to stabilize the outer edge. Inner borders can be cut cross-grain. If you need to piece your border fabric for the correct length border, 45° angled seams may be less noticeable than seams sewn at right angles to the fabric. Place right sides together and sew at an angle, as illustrated below. Check after sewing by unfolding into one long strip. If the seam is correct, trim off the corners leaving a ¼” seam allowance. Press the seam open. Plain borders are simply borders that are not pieced patchwork. Measure through the center of the quilt from top to bottom, including seam allowances. Measure from top to bottom again on either side. Use the shortest of the three measurements as the length to cut the side borders. 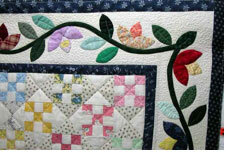 The width of the side border is the finished width you want plus ½ inch for the seam allowances. Fold each side border in half lengthwise and place a pin at the fold to mark the center of the long side. Mark the center of the long sides of the quilt in the same way as you marked the border strips. With right sides together, position the border on the quilt; match the centers, ends and any other important points of matching. Pin at these spots and then in-between as needed to ease in any extra quilt fabric. From the front, place the iron on the lighter fabric and then use the edge of the iron to push the fabric over onto the seam, so the seams go one way –toward the darker fabric. By using the edge of the iron and ironing from the front you will not have folds pressed in where you don’t want them like you may get if you iron from the back. Steam will both shrink and stretch the fabric, allowing you to adjust the fit where needed. Repeat step #1 above, measuring from side to side including side borders which have already been sewn on and pressed out. This will give the measurement for the length of the top and bottom borders. Repeat steps 2-6 above only apply the top and bottom borders to the quilt. When cutting border from a striped fabric, make sure the design is cut the same way for all four sides. Sew multiple boarder strips together first and then treat the resulting “striped” unit as one single border for mitering. Find length to cut borders by following directions below. Measure the center of the quilt from the top seam line to the bottom seam line (NOT including seam allowances.) Measure the outside edge on each side from top to bottom. *Use the shortest of the three measurements and write on the first line below. _____ Multiply the width of the border x 2. +__3_ Add 3 inches extra for seam allowances and ease of matching. =	Length to cut side borders for mitered corners. Measure through the center of the quilt from side to side, NOT including seam allowances. Measure the both the top and bottom from side to side. **Use the shortest of the three measurements and write on the first line below. =	Length to cut top and bottom borders for mitered corners. MARK THE CENTER of each side of the quilt with a pin. FOLD each border in half and mark the center with a pin. Match center of border with center of quilt. PIN each border to the quilt. Match center of border with center of quilt, and length of border pins to corner seam lines. Place more pins in-between and ease as necessary. End stitching ¼” from edge of corner. SEW from one seam line to the other using a ¼” seam allowance. Securing threads by starting and ending with a back-tack. (Viewed from the center section of the quilt, ¼” will be un-sewn at both the beginning and end of each border on all four sides.) Do not press, yet. Lay seam lines on top of each other. 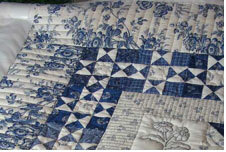 At one corner, FOLD the quilt with wrong sides together along the seam lines of the borders. The center pieced section of the quilt will be out of the way and the two borders will extend out on either side of the corner with right sides together. Using a bias square or other ruler with a 45° angle, DRAW A LINE that begins at the inside seam allowance (where you previously back-tacked) and is at a 45° angle to the outside edge of the border. This is the sewing line for the miter. Pin borders together before sewing, taking care to match if using a strip- pieced or striped fabric border. TO SEW: Sew on the drawn line, beginning at the inside ¼” seam line and sewing toward the outside edge of the border. Use tiny stitches for the last ¼” or so to secure the end without the thickness of back-stitching. that stripes and /or seams are matched as necessary. TRIM along seam line, leaving ¼” seam allowance. Pieced border are unit blocks or portions of unit blocks sewn together in rows and then used as a border. Each design unit with in a given border is called a repeat. Repeats can be simple, complex, pieced or appliquéd, set on the straight-of-grain, or on the diagonal. They can also be square, rectangular or made of triangles. The quilt center must be equally divisible by the measurement of the border repeats. For example, a quilt center that measures 32” could have a border made up of sixteen 2” border units (plus corners), or eight 4” border units plus corners, etc. PIECE A SAMPLE SECTION of the pieced border and measure to see if your cutting and sewing are yielding the proper dimensions. Make adjustments as necessary. 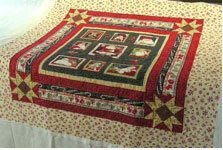 USE A PLAIN BORDER between the quilt center and the pieced border. This plain border or spacer strip can fill in whatever space you need. Cut it after the center section of the quilt and the border sections are complete. Measure the length of the pieced border sections, WITHOUT seam allowances. Measure the length of the quilt center section, WITHOUT seam allowances. Subtract the size of the quilt center from the length of the pieced border section. Divide the resulting measurement in two. That is the FINISHED width of the spacer strip. Add ½” for seam allowances before cutting spacer strips. PLAN OUTSIDE EDGES ON THE BIAS. Some quilters leave the outside edges of complex pieced borders on the bias when there are critical matching points. Bias edges are stretchy and easier to ease in if necessary.